Earlier this month, Google announced that its artificial neural networks were having creepy daydreams. While its since made the code public, a kindly soul has gone a step further and turned it into a web app that anyone can use. The new web app, called Dreamscope, is like Instagram on LSD, all powered by Google. It provides a prescriptive set of 19 filters, so it won’t let you play around with things as intricately as Google’s code will, but then, you don’t need to look at code either. You just upload an image, choose a filter and out pops a nightmare of your own making. 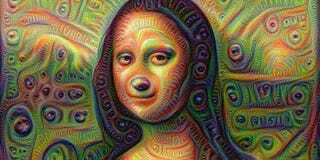 The “Deep Dream” system essentially feeds an image through a layer of artificial neurons, asking an AI to enhance and build on certain features, such as edges. Over time, pictures can become so distorted that they morph into something entirely different, or just a bunch of colorful, random noise. If you go browsing the Dreamscope gallery you’ll find some hideous—and NSFW—creations. You’ve been warned. Just look what happened to Mona Lisa. How Can I Get Over the Summer Productivity Slump? Houston Chronicle: Video Game Racism "The New Norm"?